Veterinarians are urging members of the public to buy Australian reared goldfish and ornamentals for the sake of the environment. Veterinarians and aquaculture consultants, Dr Matt Landos and Dr Richmond Loh told vets at the Australian Veterinary Association (AVA) Annual Conference in Melbourne today that the estimated 8-10 million ornamental fish are imported into Australia every year constitute a potential environmental time-bomb. "In Australia, it is estimated that nearly 3 million people are aquarists at some level and the aquarium industry has a total annual value of around $350 million," Dr Loh said. "However, approximately 40 per cent of aquarium fish sold in Australia are imported. There is also a significant unregulated and officially unrecorded trade in fish between hobbyists. "There is a constant risk of introduced fish becoming a pest if they are released into the environment or of introducing diseases to native species. That's why we are encouraging veterinarians to promote the notion of buying Australian-bred fish, preferably those species local to the area where the fish are being kept. " Dr Landos said there were potential significant benefits if people buy Australian fish for their aquariums. "The choice of native fish supports the domestic aquarium fish breeding and wild harvest industries as well as minimising the environmental risk," Dr Landos said. "The scarcity of information on the pest and disease status of hundreds of species of ornamental fish that are imported annually into Australia remains a concern. Many species that are currently imported can be cultivated in Australia, and if we encourage this domestic industry, we reduce the risk of introducing exotic diseases, and are better able to manage the risk from Australian producers through ensuring compliance with State Government's aquaculture licence regulations. 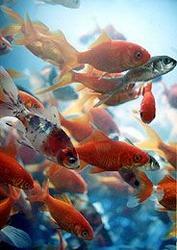 "The risks associated with the ornamental fish trade are low if fish stay within their tanks. However history shows this does not always happen. More than 17 species of exotic fish have already established in native waterways in Australia," he said.